Your inner history buff will appreciate Kaluga Holy Trinity Cathedral and The temple in honor of St. Nicholas. Get a sense of the local culture at Tula State Museum of Weapons and Yasnaya Polyana Museum-Estate of Leo Tolstoy. Venture out of the city with trips to Kaluga (Kaluga Regional Museum, St. George's Cathedral, & more). There's lots more to do: admire the landmark architecture of Tula Kremlin Museum, stroll through Central Park of Culture and Rest. PP Belousov, don't miss a visit to Peter The Great Monument, and get engrossed in the history at Kulikovo Polye. To see maps, ratings, and more tourist information, go to the Tula itinerary planner. Singapore, Singapore to Tula is an approximately 16.5-hour flight. Due to the time zone difference, you'll gain 5 hours traveling from Singapore to Tula. Finish your sightseeing early on the 3rd (Wed) so you can drive to Moscow. Get some historical perspective at Red Square (Krasnaya ploshchad) and Old Arbat (Stary Arbat). Give yourself a bit of retail therapy at GUM Department Store (Glavny Universalny Magazin) and Gorbushka (Gorbushkinsky market). 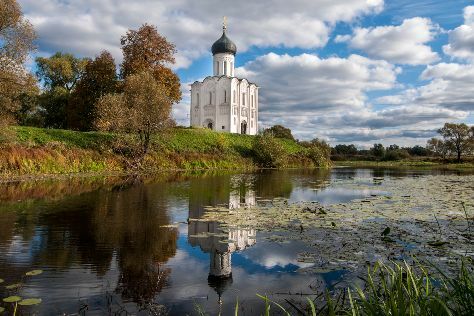 Change things up with these side-trips from Moscow: Muzey tekhniki Vadima Zadorozhnogo (in Arkhangelskoye) and Church of The Holy Virgin (in Dubrovitsy). There's still lots to do: enjoy breathtaking views from City Space Bar, admire the masterpieces at The Armoury, kick back and relax at Meshherskoye, and contemplate the long history of The Moscow State Integrated Art and Historical Architectural and Natural Landscape Museum-Reserve. To find ratings, photos, traveler tips, and other tourist information, you can read our Moscow travel planner. Getting from Tula to Moscow by car takes about 2.5 hours. Other options: take a train; or take a bus. In May in Moscow, expect temperatures between 21°C during the day and 8°C at night. Finish your sightseeing early on the 14th (Sun) so you can travel to Sergiyev Posad. Sergiyev Posad is a city and the administrative center of Sergiyevo-Posadsky District in Moscow Oblast, Russia. Kick off your visit on the 14th (Sun): take in the architecture and atmosphere at Gefsimansky Chernigovsky Skit (convent), then take in the architecture and atmosphere at Cathedral of the Assumption, and then admire the striking features of Trinity-Sergius Monastery (Troitse-Sergiyeva Lavra). To find traveler tips, other places to visit, reviews, and other tourist information, refer to the Sergiyev Posad trip itinerary maker. Drive from Moscow to Sergiyev Posad in 1.5 hours. In May, daily temperatures in Sergiyev Posad can reach 21°C, while at night they dip to 8°C. Finish your sightseeing early on the 15th (Mon) so you can travel to Yaroslavl. Yaroslavl Embankment and State Museum Preserve Rostov Kremlin are good opportunities to explore the local culture. St. John the Baptist Church and Cathedral of the Assumption will appeal to history buffs. Change things up with these side-trips from Yaroslavl: Rostov (Princess Frog Museum, Yakovlevsky Savior Monastery, & more). And it doesn't end there: pause for some serene contemplation at Church of Elijah the Prophet, make a trip to Vvedenskiy Tolga Convent, ponder the design of Strelka Fountains, and admire all the interesting features of Shinnik. To see ratings, other places to visit, traveler tips, and more tourist information, use the Yaroslavl trip itinerary planner. Traveling by car from Sergiyev Posad to Yaroslavl takes 3 hours. In May, plan for daily highs up to 23°C, and evening lows to 11°C. Finish your sightseeing early on the 20th (Sat) so you can drive to Kostroma. 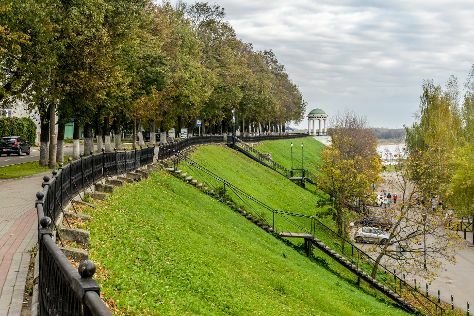 As part of Russia's Golden Ring of historical towns, the city of Kostroma is something of an open-air museum with ties to the Romanov dynasty. Your cultural itinerary includes sights like Provincial ARTgallery-M and Trade rows. Deepen your sense of the past at sights like The Resurrection Church on the Debra and Transfiguration Cathedral. Explore Kostroma's surroundings by going to Holy Assumption Monastery (in Ivanovo) and Sumarokovskaya Elk Farm (in Sumarokovo). And it doesn't end there: pause for some serene contemplation at Monastery of st Ipaty, examine the collection at Museum of Theatrical Costume, pause for some photo ops at Ivan Susanin Monument, and have fun at Snow Maiden's Residence. To find traveler tips, other places to visit, maps, and tourist information, use the Kostroma trip builder. You can drive from Yaroslavl to Kostroma in 1.5 hours. Another option is to take a train. In May, plan for daily highs up to 23°C, and evening lows to 11°C. Cap off your sightseeing on the 24th (Wed) early enough to go by car to Vladimir. Do some cultural sightseeing at Church of the Intercession of the Holy Virgin and Holy Assumption Cathedral. Transfiguration monastery and Demetrius Cathedral will appeal to history buffs. Explore Vladimir's surroundings by going to Suzdal (Church of Saints Boris and Gleb in Kideksha, Spaso-Evfimiyev Monastery Museum Complex, & more), Svyato-Bogolyubsky monastery (in Bogolyubovo) and Murom (St. Nicholas Church on the Embankment (Nikolo-Naberezhnaya), Holy Trinity Convent, & more). And it doesn't end there: take an in-depth tour of Vladimir-Suzdal Museum-Reserve, pause for some photo ops at Monument to Prince Vladimir And Saint Fedor, see the interesting displays at Vodonapornaya Bashnya Museum, and pause for some serene contemplation at Church of St. George the Victorious. For other places to visit, photos, traveler tips, and more tourist information, refer to the Vladimir vacation planner. You can drive from Kostroma to Vladimir in 3.5 hours. Alternatively, you can take a train; or take a bus. Wrap up your sightseeing on the 28th (Sun) to allow time to travel to Konstantinovo. Your cultural itinerary includes sights like Kolomna Kremlin and Sergei Esenin Museum. Explore the numerous day-trip ideas around Konstantinovo: Kolomna (Museum of Russian Marshmallow, Kalachnaya Museum, & more), Ryazan (Holy Transfiguration Man's Monastery & Palace of Prince Oleg) and Solotcha (Pozhalostin Memorial House Museum & Solotchinsky Female Monastery of The Virgin Nativity). For photos, other places to visit, ratings, and more tourist information, you can read our Konstantinovo itinerary planner. Getting from Vladimir to Konstantinovo by car takes about 4.5 hours. Cap off your sightseeing on the 30th (Tue) early enough to travel back home.